Lindley butcher John Bradley has won the annual Pork Pie competition held at Ripponden’s Old Bridge Inn. It was his first success at the fifth time of trying, and he beat 45 other entries from around the country. 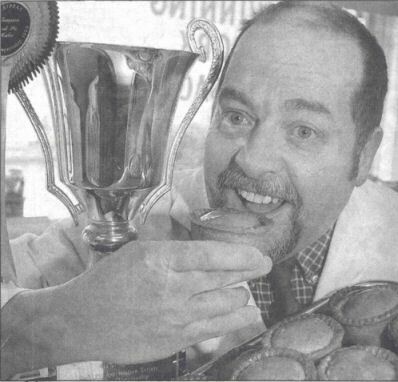 Mr Bradley usually sells about 300 pork pies a week, but publicity about his prize-winning pies has doubled sales. “I was at It making pies all yester­day and I’ve a lot to do today, too” he said. The Pork Pie Appreciation Society meets regularly at the Old Bridge to test and taste pies.